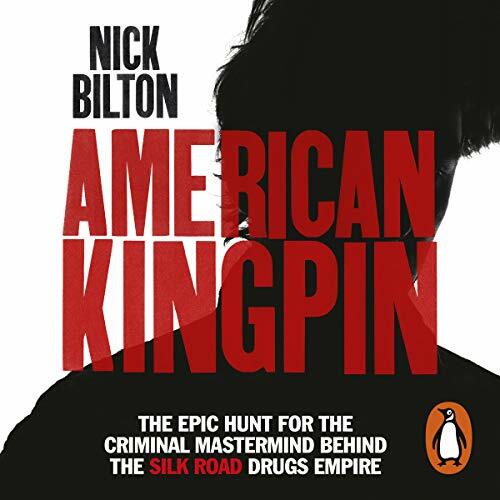 Random House presents the unabridged downloadable audiobook edition of American Kingpin by Nick Bilton, read by Will Damron. From New York Times best-selling author Nick Bilton comes a true-life thriller about the rise and fall of Ross Ulbricht, aka the Dread Pirate Roberts, the founder of the online black market Silk Road. In 2011, Ulbricht, a 26-year-old libertarian idealist and former Boy Scout, launched 'a website where people could buy anything anonymously, with no trail whatsoever that could lead back to them'. He called it Silk Road, opened for business on the Dark Web, and christened himself the Dread Pirate Roberts (after the Princess Bride character). The site grew at a tremendous pace, quickly becoming a $1.2 billion enterprise where you could buy or sell drugs, hacking software, forged passports, counterfeit cash, guns, grenades, and poisons. The Silk Road soon caught the attention of the feds, who embarked on an epic two-year manhunt for the site's proprietor. Ulbricht, in the meantime, struggled to maintain control of his double life and his marketplace, which he originally started to prove that legalising drugs could make society safer. He gradually abandoned his libertarian ideals to rule Silk Road with increasingly authoritarian force. At one point he engaged the services of hired hitmen to take out employees he felt had wronged him. Soon some of the federal agents who were supposed to be hunting for Ulbricht were lured into the dark world and switched sides to join him. This is a true-life thriller about ambition gone awry, spurred on by the defining clash of our time: the new world of libertarian-leaning, anonymous, decentralised web advocates and the old world of government control, order and the rule of law. Bilton's dazzling rendering and gift for narrative make for an endlessly fascinating drama. As the title says, this book was simply amazing. The story telling is excellent and no question was left unanswered. very well researched and narrated. highly recommended listen for all. Great story line, well thought out and really well told. Best audible I have heard so far and definitely recommend it. Gripping, highly detailed and fascinating listen. I wasn't actually expecting such a brilliant listen when I bought the book. I'd heard about the Silk Road but didn't know too much. Absolutely gripping story, albeit slightly repetitive at times, but truly fascinating, from every aspect. Wonderful! This has to be in my top reads at audible. The narrator does a great job that you feel you are there with the protagonist at every step along the way. Beautifully describes the depth and complexity of the characters that almost makes you sympathetic to each side by the end. What I loved about American kingpin is the fast paced unfolding of the storyline! Must read!! No matter how good you are if you gamble too many times you will get caught. It just interesting that there is so much going on out there. You dont know what you dont know. never have I heard a 12hr long audio book in such a short time!!! more than really good! Captivating story - perfect and thrilling to listen to on the daily commute! I reccomend it! Great story. Never finished 12h of listening so fast. Tje reader is also a perfect fit and is doing a great job. This book is entertaining from the first to the last minute of listening. It's for anyone who is into crime stories and/ or into internet culture. Not only is this one of the most interesting tales I've come across but the author managed to capture all players, their motives and struggles in such a lively way it was impossible to stop listening to it. Hatching Twitter, the other book I know from him was equally absorbing and I can fully recommend this book to anyone. Also the audio version was one of the best. Really happy I made this purchase.